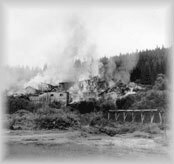 On March 23, 1936, the Cariboo Gold Quartz Mining Company's powerhouse burned down with an estimated loss in machinery of $160,000. It was quickly rebuilt with good insurance coverage. With new equipment installed, it had the capacity to produce 275 tons of ore per day. This was impressive since, in its humble beginnings produced 50-75 tons of ore per day. The first strike by workers that occured in 1937 slowed the mining development, as did the strike in 1946 and the event of World War II. The old Number One Shaft on Cow Mountain closed down in 1959, and the Cariboo Gold Quartz Mine closed entirely in 1967. During its 34 years of operation, CGQ produced $31,000,000 in gold. Unfortunately, the remains of the mine were destroyed in 1977 when the property caught fire. The Island Mountain Mine Company owned 29 claims over 991 acres on Island Mountain.The mine began development in 1933 (the same year as the Cariboo Gold Quartz began production) and lasted 19 years in operation. Owned and operated by the Newmont Mining Corporation of New York, J. P. Morgan & Company (one of the largest mining organizations in the United States) was the financier. The Newmont Mining Corporation had worked for the Cariboo Gold Quartz earlier. Newmont purchased a group of claims from C. J. Seymour Baker in 1933 and development began. Mr. Baker had bought the claims from Peter Dunlavey back in 1902. Gold had been proven to exist back then, but problems retrieving the gold at that time prevented Dunlavey's success in his mining claims. Philip Kraft was appointed resident manager, but Island Mountain Mines Company Ltd. took over when they became incorporated on October 12, 1933. By 1935, the mill was producing 100 tons of ore per day. A find of ore yeilding 0.66 ounces of gold per ton was discovered and kept the mine going. The ore strike happened to run into the Cariboo Gold Quartz's claims which led to them exploring in that direction as well. The strike of the miners in 1937 closed down Island Mountain Mines May 15 - August 1, with little being resolved. The 1946 strike also arrived during financial struggle for both mines. Newmont Mining Corporation, the mining branch of J. P. Morgan & Company, closed the mine and sold the property to the Cariboo Gold Quartz Mining Company August 15, 1954 for $305,000.00 after many years of financial struggle. Cariboo Gold Quartz continued operation and changed the name to Aurum Mine. Unfortunately, it did not produce encouraging results. However, 812,000 tons of 0.43 ounce gold ore was milled during this twenty year period, with $1,518,283 returned to the shareholders.